Companies using the latest cloud computing solutions have been urged to ensure they have a good relationship with the manufacturer that is providing them. Seth Robinson, one of the authors of the CompTIA second annual Trends in Cloud Computing report, explained that a service level agreement (SLA) is a key factor in any deal to purchase and use a particular product. "With the cloud, (companies are) trusting a significant portion of their IT to another provider and then you would have something like security goes down or even some downtime," Mr. Robinson stated. 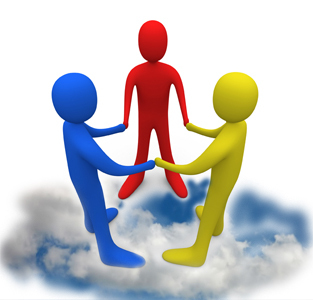 Read More to see why Cloud Computing users are advised to focus on relationship with providers. Selecting the right cloud is just as hard as predicting the weather correctly. Small and medium sized businesses need to finish their part of homework before plunging into an agreement with any cloud-computing firm. Check out some of the few points that can guide you in selecting the right vendor. Some people describe securing the cloud as a datacenter challenge, sometimes as a software issue, and sometimes as a data or device access issue. In reality, securing the cloud depends on working out where and how to apply those measures specific to your end user. Indeed security services are continuing to develop, enabling a cloud delivery model and allowing us to have security increasingly delivered in cloud services. This will be applied to both the cloud infrastructures and to services in their own right. In essence the cloud model is evolving as one of the core models for delivering services. HDMI VGA port is beneficial in terms of technical process. Nice post. Thanks for sharing. Thanks for sharing. This is great information.We are the leading security providers to commercial and residential complexes. You can call us for top or the order security products and solutions. Visit us for Security in Reigate.We can offer an extensive range of alarms and security services to homes and commercial buildings in Croydon, Gatwick, Reigate, Banstead, Horsham, Horley and Crawley.